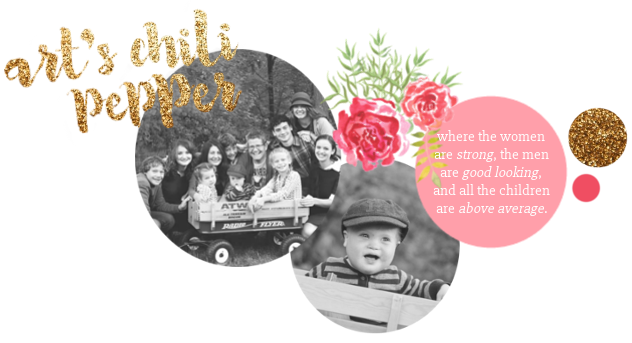 Art's Chili Pepper: Happy 4th Birthday, Samuel! Last week I asked him what he would like for his birthday. He said he wanted Suzanna. My hubby explained that he couldn't have a three year old girl for his birthday. In his exasperated voice, he explained that he wanted Suzanna to come over to play. With the planning session taken care of we began his day in the Wachter tradition of waking him up with a bed full of balloons and a good old fashioned lot of commotion as everyone attempts to shout "Happy Birthday" in unison. Sam is the only person in this house who has the decency to stay asleep through the racket of waking everyone else up. Which is truly amazing to me because the other 364 days a year, everyone has to be dragged out of bed. But not on their birthday. No, sirree. When it would be convenient for them to sleep in for a while, even Kaitlin, is wide awake at the crack of dawn. Although, everyone likes the balloon ritual so much, that they do at least "pretend" to be asleep...which they aren't really good at...but part of the game has become, telling the birthday person that we know they weren't asleep. Birthday's in our house translate to food. Did I ever mention we are Italian? And my German born husband has decided he likes food so much that on birthdays he pretends to be Italian. A few years ago, Nathaniel must have been about to turn five, he said in his most serious voice, "We need to talk." And then, "For my birthday breakfast, I would like to have chip beef gravy on toast." He continued to tell us the rest of the food, including dessert, that he expected to see on the table when the big day arrived. Yes, even at a young age, they understand that any special occasion translates into what will we eat? In case you've not figured it out, the birthday person gets to pick the menus and/or choose where we will eat out. After his breakfast of waffles, strawberry yogurt, grapes and chocolate soy milk, (almost all of which was left on the table) Sam had to go for his haircut. Not in itself all that exciting, I know. But, I almost always have a point. Sam walked into the salon ahead of me and the receptionist that he has become friends with over the years greeted him. He piped up to say that today was his birthday. Miss Paige said, "Oh, I know what that means. What are you going to eat today, Samuel?" How pathetic is it that even casual acquaintances know this about our family? And with that said, haircuts were followed by some fun at the Chick-fil-A play place. Brianna is a connoisseur of luggage. She is the one I have to thank for the vintage piece in my "foyer". She has been giving each of the kids their own suitcase for their birthdays. Samuel was thrilled to get this extra special matched set with suitcase, backpack and toiletry case. And he was thrilled to at last have a football helmet to go with his Raven's uniform. He wore the outfit with the helmet all around...even outside to ride his tricycle, dragging the suitcase behind. Even even attached the suitcase to his tricycle like a trailer hitch. Kaitlin made him a cake decorated with his favorite character and beloved lovey, Eeyore. Who he calls woof-woof. Because, when he was 2, he had never seen pooh bear before. And his Auntie Dawn brought this to him as a gift. And he thought it was a dog. And so he called it woof-woof. When he would take it out in public and people would comment on his "Eeyore" he would get so upset and say, "No, his name is Woof-woof!" And you can bet he was shocked when he first saw a Pooh Bear movie and there was his Woof-Woof and they called him Eeyore! I know. What a deprived child. That my friends is the danger of raising children without television. So, now where was I? Oh, that's right. You all need to keep up with me. KK made him a cake. Which looked like this. And he asked if he could put the candles on. Which looked like this. On birthdays, while we eat cake, we go around the table and share what we appreciate about that person. On Samuel's fourth birthday it went something like this. Samuel thinks outside the box...like a shovel for a soap dish. He was also cited for the way he runs to comfort every boo boo or tear by bringing in lovey, woof-woof. Pa admires his enthusiasm for everything and I am particularly blessed by his unwavering faith, willingness to help with anything and the way he faces every problem by saying, "I know let's ask Jesus to..." find it, bring Art home, make so and so better...fill in the blank. We also offer a blessing for the birthday honoree for the coming year. Among Samuel's were that Aedan hopes that he continues to be a servant to God and Emma prays for him to continue learning about the Lord. I will close this record of Samuel's 4th celebration of the life bestowed on him, and the blessing he is to us, with the promise I claim for his next year and all those to follow. Aww... Samuel is such a sweet little man. We will have to get together soon, once my children are over their colds. Happy Birthday Samuel!!! What an awesome celebration of his birthday...Happy Birthday Samuel. Sounds like they all feel like royalty on their special day. Happy Belated birthday to Samuel! Sounds like he had a great day! I love the idea of your daughter giving everyone luggage! She is brilliant! I wonder what she will give next year? Food is a big part of our kids birthdays, too. My oldest already has his birthday dinner picked out, and it isn't until next month!